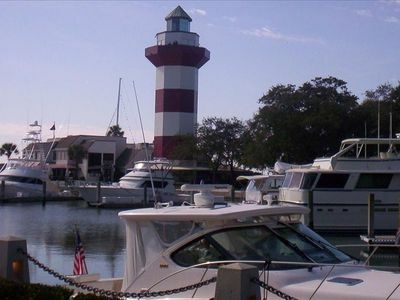 The Hilton Head Resort offers the perfect Oceanside retreat designed for those who like to enjoy the beach no matter what time of the year. 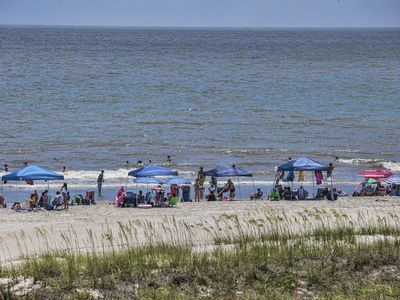 Our beach is one of the nicest beaches on the East Coast. While walking on our boardwalk to the beach or to our beach cabana, Coco’s on the Beach, you can enjoy the pristine ecological marsh. The resort is a great place to relax and enjoy the sun, bird watching and later in the evening a romantic stroll. 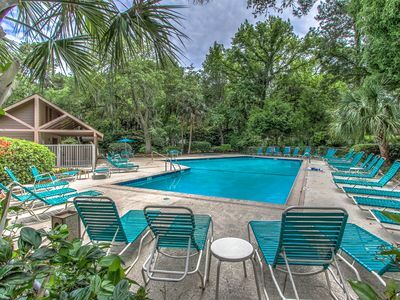 The Hilton Head Resort offers more amenities than any other resort on the island. Designed where you can enjoy all types of activities no matter what the season. 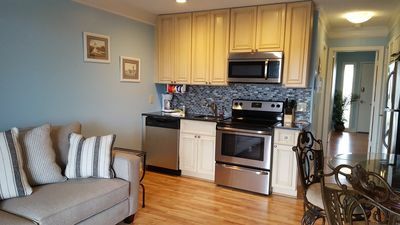 Our condo is located in Building one on the first floor for easy access and great views of the lagoon. 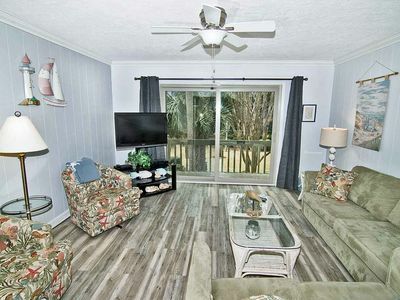 Our Condo was recently remodeled from floor to ceiling with new porcelain floor tile, new dry wall (not just painting over the old paneling like many of the other units), smooth ceilings, modern light fixtures, ceiling fans, paint, and furnishings. 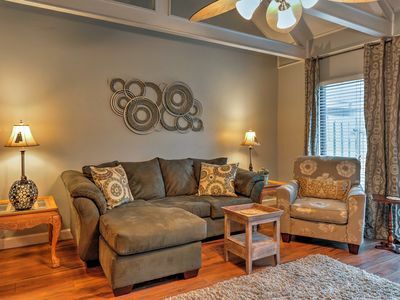 Our Living area offers a Queen sized sleeper sofa, 51” Flat screen HD TV, Blu-ray player, and an Ipod-dockable sound bar with separate subwoofer. You also access our private balcony via the sliding doors. Directly outside our balcony, is a beautiful lagoon with a fountain and many of the island’s wonderful wildlife can be seen there. 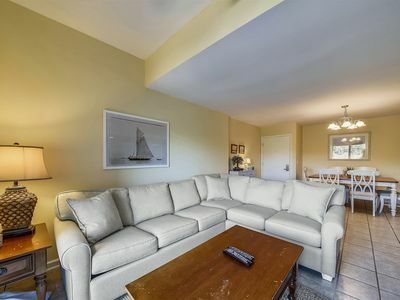 The dining area adjacent to the living room offers seating for 6. 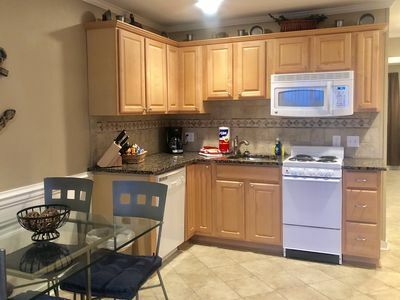 The kitchen has full size appliances and all utensils you will need to prepare a meal for your whole family. The master bedroom has a comfortable queen size bed with all luxury bedding, a private bath and ceiling fan for your comfort. 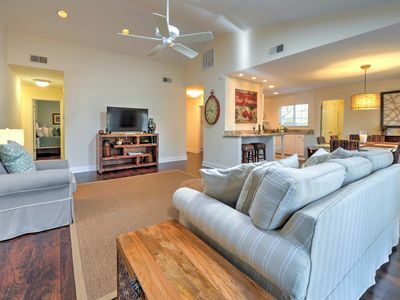 There is also a 25” LED HDTV with Blu-ray player in the master bedroom. The guest bedroom sleeps up to 4, and features a twin bed and twin over full bunk bed, all with new quality bedding. Both bedrooms offer large amounts of storage space.The guest bathroom has a walk in shower, and the master bathroom has a full tub/shower. A hair dryer as well as an iron and ironing board are provided. 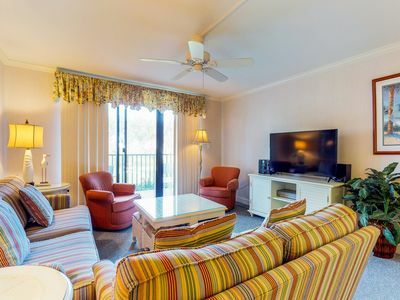 Our condo is fully equipped with everything you need for a perfect family vacation at the ocean. Only the scenic tidal marsh separates us from the ocean, but a short stroll or shuttle ride down our boardwalk leads you directly to the beach and our private beach cabana - Coco's. At Coco's cabana bar you can enjoy your favorite beverage and food hot off the grill; listen to music or play beach volleyball. 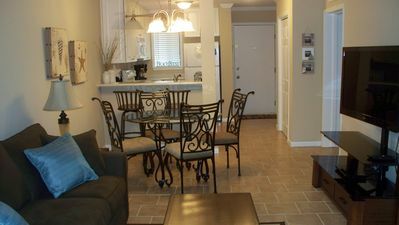 The condo and complex are perfect for relaxing couples or active families. 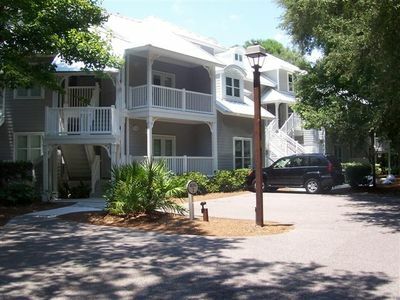 The Resort is located ocean side between Palmetto Dunes Resort and Port Royal Plantation. 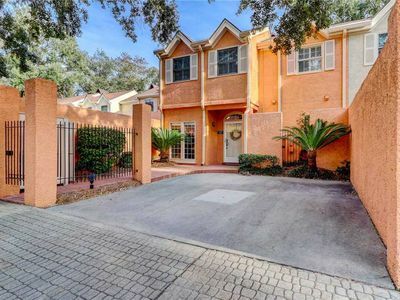 Our gated community with 24 hour security is right next door to the Robert Trent Golf Course. 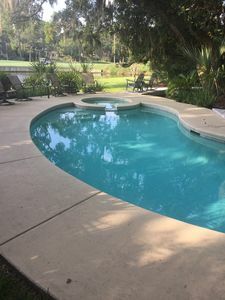 We have six lighted tennis courts, three wonderful pools: two outdoor and one heated indoor pool and hot tub, sauna, exercise/weight room, indoor walking track, sundeck, on-site mini grocery store & restaurant, picnic & grilling area, and playgrounds. 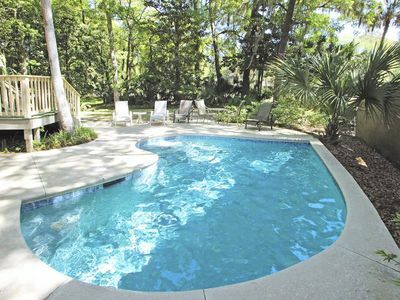 All these amenities are free to our guests, making this the perfect choice for your vacation. 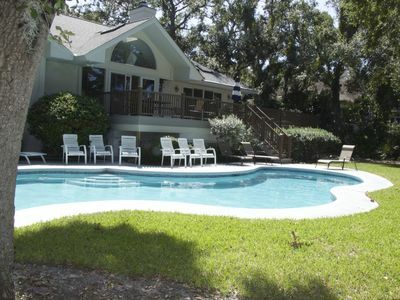 We are conveniently located near all the other island activities for which Hilton Head is famous. Directly outside our security gate is a paved bike path that goes from one end of the island to the other. 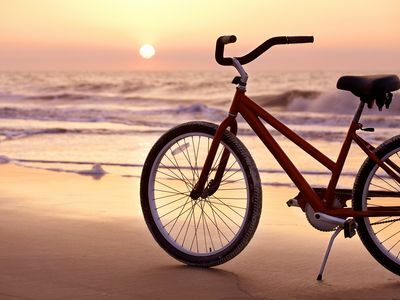 Bike rentals are even available on site for your convenience. AMAZING LOCATION!! Harbour Town perfect! 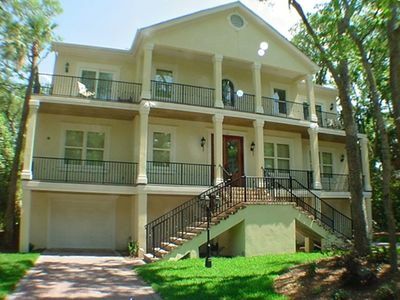 A 5 star vacation villa to call home! 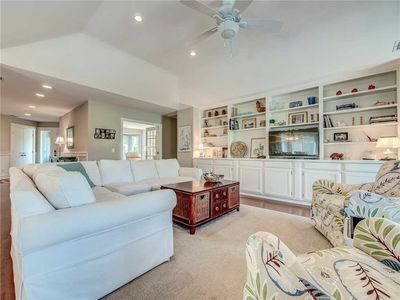 Spectacular home is located on Golf Course in Palmetto Dunes. 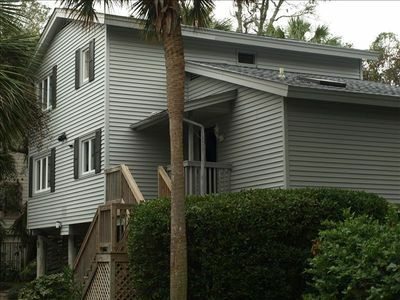 Bright condo w/ full kitchen, shared pool, hot tub, beach access & more! 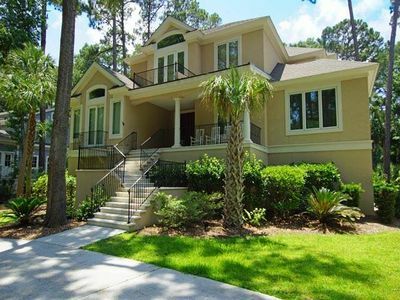 3 Bedroom, 3 Bath in Sea Pines near Harbour Town!